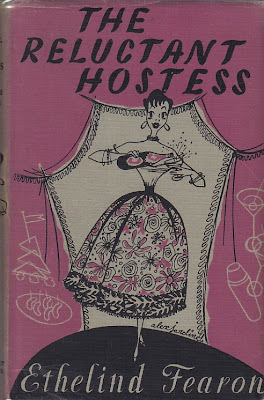 Today’s etiquette tips come from the most reluctant hostess, Ethelind Fearon, whose book, The Reluctant Hostess, makes entertaining a breeze or perhaps a bracing wind! Have you ever wondered why we entertain? Fearon gives us the historical perspective on this practice. In the Stone age people lived in their own caves, stalked their own food – a fair contest between man and beast with no holds barred—and ate it themselves, habits with much to recommend them. Entertaining began – like a lot of other customs – in the East. There was a law –in a time so far back that they only make important ones and people could therefore remember them – that if you had eaten bread and salt with your neighbor you couldn’t poison him during the current year. Or he couldn’t poison you, I forget which. Probably a bit of both. So people with good sense took care to dine out pretty often even if they had better food at home, because it wasn’t so much a meal as an insurance policy. That makes such good sense! Now for most parties you need drinks and snacks or "cocktail snippets" as Fearon calls them. Anything mangled up and sitting on a biscuit is a cocktail snippet. 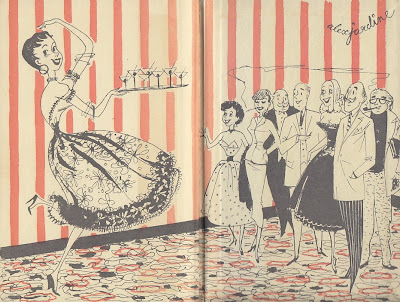 Any party stands and falls, as much as anything, by the nature and excellence of its drinks. To sum up: For all cocktails economy is fatal. Spare the gin and spoil the party. Admittedly entertaining entails work, but if it’s a life of unrelieved sloth you are after, you’ll bore yourself and everyone else to death and kill off all your friendships at such a rate that there will be no need to entertain. Entertaining isn’t just ordering a gargantuan meal and the writing a proportionate cheque. It is planning the most pleasure fro the most people with the least pain to yourself. Wow, if everybody followed these simple rules, life would be a party! So stop being reluctant -- grab the gin, mangle up something on a cracker and get to it. To check out Ethelind Fearon’s "reluctant cooking", head over to the Cookbook Of The Day blog and find her bold recipe for Leftover Rice Pudding Salad.